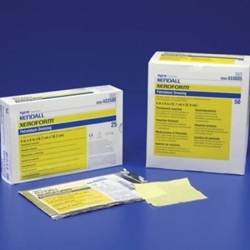 Petrolatum Dressing - Covidien 2" x 2"
Xeroform Petrolatum Gauze Dressing is a 3 percent Bismuth Tribromophenate in a special petrolatum blend on fine mesh gauze. Dressing is square in shape, white, and measures 2" x 2". Comes 25 per box. Dressing is non-adherent while it clings and conforms to all body contours. Bacteriostatic action.